Please join us for a special webcast of the Smithsonian Material Culture forum to mark the 75th anniversary of D-Day. From its grand strategy to the personal stories of individual soldiers, the history of D-Day remains a captivating and rich story. To usher in the 75th anniversary of the battle, the Smithsonian offers a series of highly perceptive presentations in its 112th Material Culture Forum. “Forgotten Voices, Forgotten Objects” presents new avenues of historical inquiry, highlighting objects in the Smithsonian and non-Smithsonian collections as well as the research of experts on the topic. RSVP for the webcast here. Richard B. Frank, a lawyer and military historian, has written several books and articles on the Pacific Campaign of World War II, including Guadalcanal: The Definitive Account of the Landmark Battle (1990), Downfall: The End of the Imperial Japan Empire (1999), and MacArthur (2007). Speakers will give lightning talks on a variety of topics, followed by Q&A. 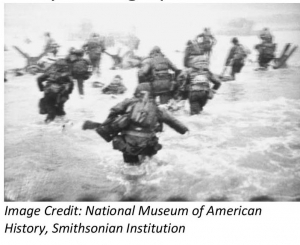 Description: This presentation will focus on personalizing the memory of D-Day: how do memorials create official versus vernacular/local/personal memory? How does material culture inform memory? Whose responsibility is it to maintain memorials? Who gets remembered? Who gets forgotten? Description: How technology can be simple but when employed in an innovative fashion, also transformative. Description: This presentation highlights the experiences of Latinos in D-Day and discusses the significance of Latina/o participation during World War II. Description: This presentation will highlight African Americans on D-Day, using a few select objects from the D-Day invasion currently on display at NMAAHC. It will also emphasize other African American experiences during World War II. And Herman J. Viola, PhD. Description: As part of its NMAI Veterans Memorial project research, this presentation will feature the story of Charles Norman Shay who served at Normandy and has been honored with a memorial overlooking Omaha Beach and some of the other stories of Native American service connected to D-Day. Description: This presentation will include a discussion of two unique items00a scrapbook and a personal diary—submitted by D-Day veterans Felix Adams and Homer Hall to the Veterans History Project at the Library of Congress. Description: Intelligence and counterintelligence played a critical role in the successful D-Day landings. German spies in Britain were captured and turned, codes were broken, operatives collected information behind enemy lines, aerials surveillance provided visibility in German troop movements and fortifications, and a successful deception campaign pointed the Germans to false landing sites. Without the accumulation of information and insight into German operations, the D-Day landing may have ended in disaster. 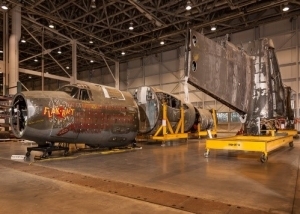 Description: American aircrews flew the Martin B-26B Marauder bomber named Flak-Bait on more missions than any other American warplane during World War II, which included three times on D-Day. The Material Culture Forum was organized in 1988 with a mission of maintaining the sense of a scholarly community throughout the Smithsonian museums, libraries, and research and cultural centers. The Forum considers topics from the vast world of objects that the Smithsonian collects, preserves, studies, and presents.